If you like macaroni and cheese – and a lot of it – then you’re not alone. And Costco knows that. The wholesaler is selling a 27-lb. bucket of one of America’s favorite comfort foods. And if you’re worried about getting through it quickly, have no fear: the product has a 20-year shelf life. But while the macaroni and cheese might last many years in the bucket, it has been gobbled up swiftly. 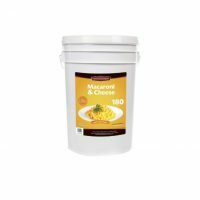 Less than 24 hours after People magazine reported on the product, the Chef’s Banquet Macaroni and Cheese Storage Bucket is listed as “out of stock” on Costco’s website. According to Costco’s website, the product contains 180 servings and costs $89.99.